"Compassion is the Autobots' downfall." 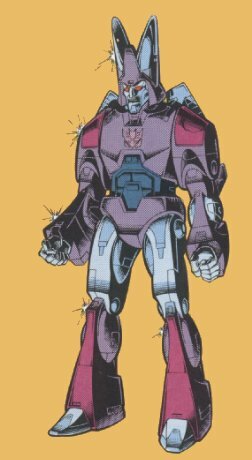 Profile: Cyclonus is a huge and emotionless air-warrior metamorphosized from parts of dead Decepticons and remnants by Unicron. Like Galvatron, he derives vast resources of power and energy through Unicron and so can draw on strength in direct proportion to its need - always being able to become stronger than his opponents because of his access to the infinite reservoir of power that Unicron represents. A dedicated destructor, Cyclonus transforms into a gigantic multi-engine (and perhaps multi-wing) jet fighter. His firepower remains intact and is augmented by an incendiary bomb rack. Cyclonus is capable of an additional transformation, trimming his wings and tail back to assume a space-worthy rocket mode for interstellar pursuit and warfare. He has no personality, no interests other than conquests for the sake of Unicron, and no weakness. Abilities: In jet fighter mode, Cyclonus is equipped with nuclear-powered turbine engines which enable him to reach speeds greater than Mach 2. In robot mode, he carries an oxidating laser that fuses an enemy robot's internal mechanisms.